If you’re going to be a powersports dealer, it’s good to know how to sell used bikes. That is exactly what brothers Paul and Kirk Compton (and their father Gar) took to heart their first 10 years in the industry. Kirk had been working in the industry since the mid-’80s and later enlisted his brother and father to help him find used bikes to buy and sell. Paul didn’t know much about motorcycles, but he was a fast learner and good at negotiating deals, and Gar (a retired banker) kept an eye on the finances. “We started selling retail about 20 years ago, says Paul Compton, partner of State 8 Motorcycles in Medina. “We sold only used bikes for about 3-4 years which we bought right out of the classified section in the newspaper. This was back in the day of pagers and pay phones,” he says about their inauspicious start in the motorcycle industry. By 1995, the Comptons opened a retail operation on old State Route 8 in Cuyahoga Falls, Ohio, selling their pre-owned motorcycles. They decided to call the place State 8 Motorcycles and shortly after set up their first franchise with Suzuki and then Yamaha, and eventually added Kawasaki and Honda, too. Fast forward to 2005, and the Compton crew opens a second store in Medina, Ohio, less than 20 miles from their original location. 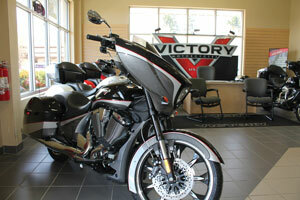 The dealership was built in 2003 by the original owner of Century Harley-Davidson. He also owned Century Polaris, so the dealership was built as a standalone Polaris store. The high ceilings and exposed beams seem to fit the area and the product mix with its architecture. Many older dealerships have low ceilings and not as much open space. “We have a nice open floor plan so we were fortunate to get this space. We started off just leasing the building. And when we leased, we only had space up to where the service department is now. The back storage area was not built yet. State 8’s two locations are very different animals. The Falls store is close to Akron and a much larger store that sells a lot of sport bikes and cruisers, as well as gear and accessories and everything in between. The customer base tends to be more Gen Y than Baby Boomers, which are more of the customers they get in the rural Medina location. 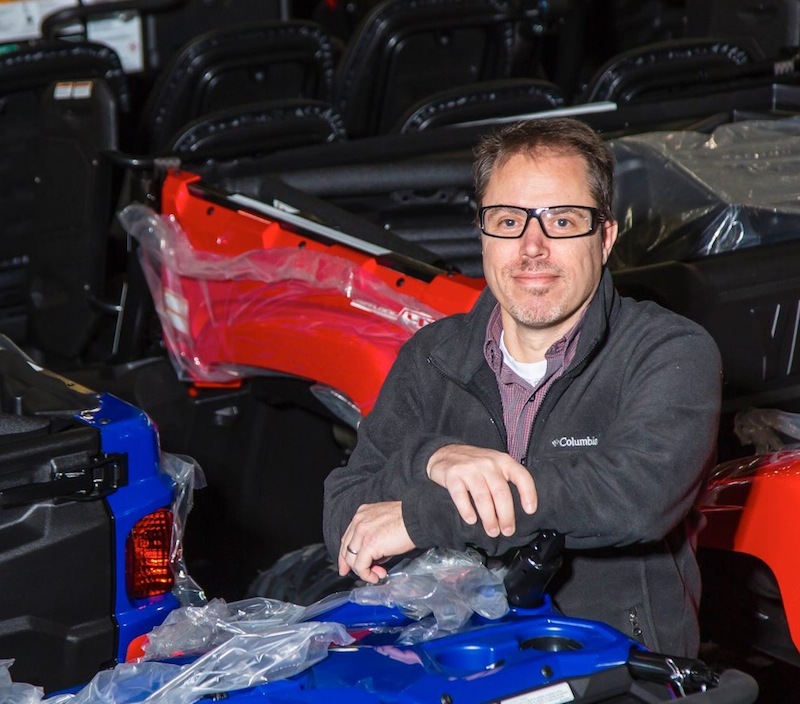 While the Falls store focuses on many types of customers and is a large multi-line powersports retailer, the Medina location is more focused on Polaris and Victory, as well as Vespa, which is just fine by Compton who has been tasked to run the dealership. Polaris just started coming into their own right about the time when State 8 bought the franchise. In the ‘90s, Polaris’ off-road models were more or less based on its snowmobiles and it really wasn’t the best product, according to Compton. “Right when we got our store, Polaris revamped its whole line. I mean, they were making two-stroke 4x4s,” he laughs. 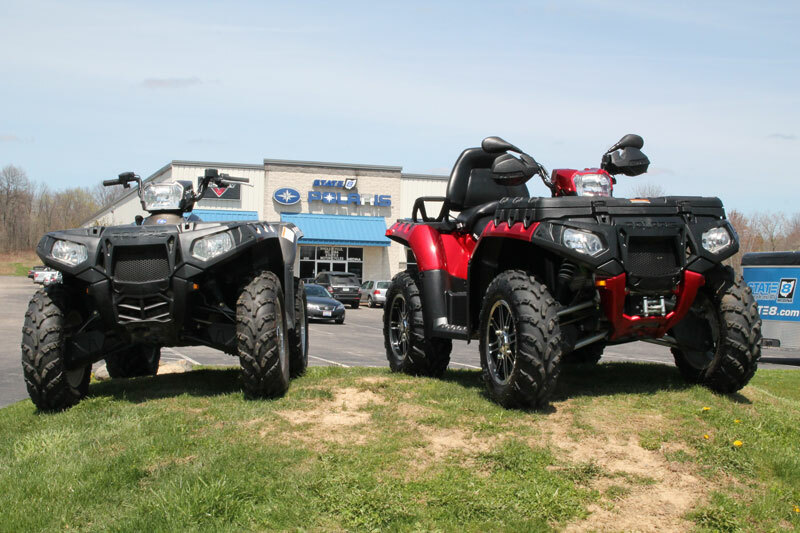 “They started coming into their own with a much better lineup, and then in 2008 they came out with the RZR and that really took off. 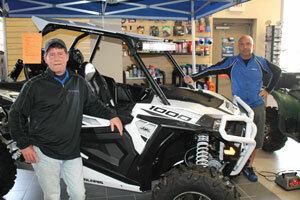 From then on it has been good,” he says, noting that he sells more SxSs than ATVs today. Compton recently added Vespa to the mix because he wanted a new brand that didn’t compete with anyone, and he didn’t want to have to add on more dedicated space. He’s hoping to do that with some other brands down the road. 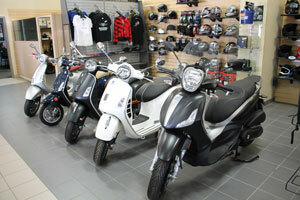 “In the beginning, Vespa required dealers to build boutique stores, which would have required a big investment. But now they are even throwing them into some car dealerships,” says Compton. The next challenge for State 8 Medina, according to Compton, is building up some of the other areas. The company has selling pre-owned units down pretty well, but getting to that next level with a dedicated apparel department and accessories is the next step. Compton acknowledges that some of what has made them strong is the diversity of units they carry. Whether a customer wants a $2,500 used motorcycle or a $20,000 Polaris RZR, Victory cruiser, or Vespa, State 8 Medina has something for everyone who walks in the door.